Girls Go For the Gold! 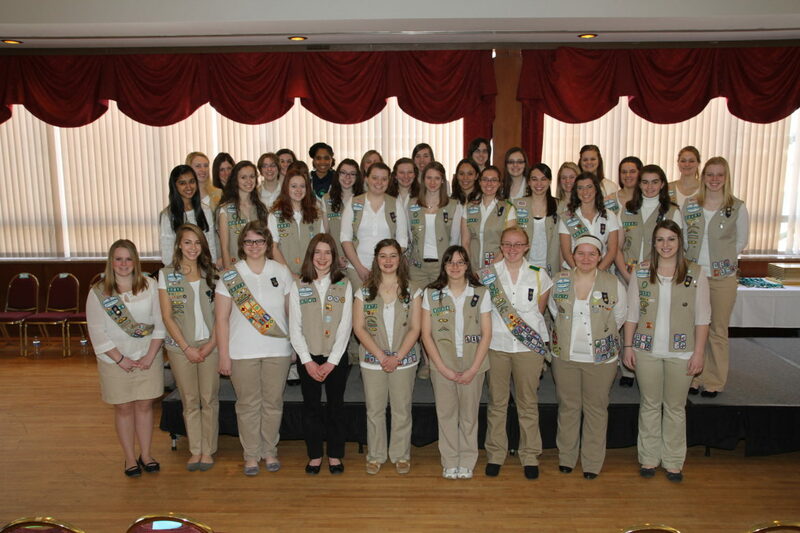 Congratulations to our 2014 Girl Scout Gold Award recipients! What better way to start Girl Scout Week than with the annual Gold Award Ceremony on Girl Scout Sunday! On Sunday, March 9, 2014, Girl Scouts of Western Ohio hosted our first councilwide Gold Award Ceremony bringing all four regions together to honor the 44 girls who earned the highest award in Girl Scouting. The University of Dayton, Kennedy Union Ballroom set the scene for the honorees who were able to attend this mementos event with their families, leaders and friends. Keynote speaker, Col. Cassie Barlow, 88th Air Base Wing and Installation Commander at Wright Patterson AFB motivated the audience and recognized the hard work of the Gold Award recipients. The room was full of family and friends of the recipients along with Girl Scout alumni, volunteers and honorable dignitaries. Girl Scout Week is a great time to talk to your girls about what they want to achieve in Girl Scouting. The Girl Scout Gold Award gives girls an opportunity to give back to their community in a big way while also building their resume. Even if you have Girl Scout Daisies or Brownies, you can start leading the girls through a Take Action project. Each Girl Scout Journey leads the girls and the leader through the discover, connect and take action process. For Girl Scout Juniors, girls can begin working on their Girl Scout Bronze award which follows a similar process as the Gold Award. The same goes for Girl Scout Cadettes and the Silver Award. These two awards are great practice for the independent, large scale Take Action project that is the result of a girl earning her Gold Award. There are Girl Scout Silver and Gold Award workshops offered at each regional Girl Scout Center. Start today and build the leaders of our community and future Gold Award recipients.